Have you heard of the raw series going on right now, inspired by Brittany, over at Real Sustenance? 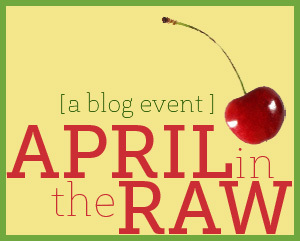 If not, the low-down is that April in the Raw is the event that is bringing you the most wonderful Raw-Inspired Recipes from some of the healthiest bloggers I know. We are just entering the third week of this event, but so far Weeks 1 and Weeks 2 have proved to be nothing short of amazing and have totally inspired me. When I was working on my schooling in Nutrition, there were many things that changed the way I will forever look at food. But one thing that stuck with me the most, and incidentally what I base our family’s own health on, is the importance of a healthy functioning digestive tract in relationship to the health and functioning wellness of the rest of the entire body. Extraordinary digestive health supports the health of the brain, the immune system, detoxification of our bodies, and elimination. Living foods, full of beneficial enzymes and probiotics, are completely essential in this process. The following list, in my opinion, can be considered to be some of the best foods to include into your diet on a daily basis to optimize your digestive health and also give your brain a little boost as well. 1. Berries – an important source of fiber, phytonutrients, and are powerful antioxidants that can support normal bowel function. Blueberries are among the best source of Antioxidants. They are also packed with Vitamin C and Cancer fighting compounds. 2. Fresh green juices – such as Kale, Chard, Mustard Greens, Celery, Parsley, Cucumber, Broccoli, and Cilantro. These make for wonderful digestive daily tonics. They are rich in Vitamin A, Vitamin K, folate, Vitamin C manganese, chromium, and fiber. 3. Avocados – an excellent source of Vitamin E and potassium (almost twice as much potassium as a banana), as well as healthy fats and fibers. Also rich in protein and enzymes, avocados also contain calcium, Vitamin C and K, folic acid, and sodium. Ripe avocados are naturally pure and furnish all of the elements we need to build the highest quality protein in our bodies. Because avocado is a ripe, watery, enzymatically-alive fruit, it ranks as the most easily digested rich source of fats and proteins in whole food form. The ripening action of the sun “predigests” complex proteins into simple, easily digested amino acids, making it a wonderful aid to the digestive process. 4. Chia Seeds – freshly ground, as oil, or as seeds – these can help support healthy digestive function and overall health and wellness. Chia seeds are nutrional power-houses. They are high in Omega-3 essential fatty acids and are packed with protein. They have a wonderful balance/ratio of Omega 3 Fatty Acids to Omega 6 Fatty Acids. They are easily digested, more-so than flax seeds, and therefore it is not essential to grind them. 5. Raw Kefir – either from raw milk from grass-fed cows, from goats, or from raw Coconut Milk – Loaded with Probiotics and Minerals and supports digestive health and maintains normal immune system functioning. Loaded with live Probiotic Cultures, Enzymes, and Minerals. You can read more about the Benefits of Kefir in this post. 6. Pumpkin Seeds and Sunflower Seeds – eaten raw, both are excellent sources of Vitamin E, Vitamin B, Manganese, Folate, Vitamin B5, Selenium, Phosphorus, and Copper. And Pumpkin Seeds, of course, contain an abundance of Zinc, which aids in functioning of immune system, digestion, control of diabetes, improves stress level, energy metabolism, acne, and wound healing. 7. Papaya – loaded with living enzymes, they contain Papain and Chymopapain, two enzymes that aid in digestion by breaking down proteins and soothing the stomach and digestive tract. These enzymes also help to reduce inflammation in diseases like asthma, osteoarthritis, rheumatoid arthritis, and can even aid in healing of burn wounds. Papayas also provide protection against developing colon cancer with a complex nutritional source of antioxidants, phytochemicals, minerals, and fiber. 8. Almonds – eaten raw, they are higher in fiber than any other nuts. They contain healthy Calcium, Phosphorus, and Magnesium, Omega 3 and 6 fatty acids, Vitamin E, and Zinc. Soaking raw almonds removes harmful tannic acid and enzyme inhibitors making the nuts easy to digest and releasing their full nutritional value. 9. Coconut Oil (when raw, organic, un-refined) and Coconut Cream – Highly nutritious and rich in fiber, Coconut is Anti-Viral, Anti-Bacterial, and Anti-Fungal. The anti-microbial properties of the coconut helps in dealing with various bacteria, fungi, parasites that cause indigestion and irritable bowel syndrome. Coconut oil also helps in absorption of other nutrients such as vitamins, minerals and amino acids. It supports your immune system, metabolism, and heart health as well. 10. Raw Cultured/Fermented Vegetables, such as Sauerkraut and Kimchi – a first rate source of live probiotics, and organic acids, which help to create a healthy intestinal environmental balance. Fermented food uses microorganisms to convert sugars into lactic acid, creating a signature sour taste. This fermentation process is almost like the beginning of digestion (much of the work has already been done for you). 1. For crust: Grease 9 openings of a muffin pan. Cut plastic wrap into 9 – 6 inch by 6 inch squares and place one piece in each opening. 2. In food processor, add pecans and process until finely chopped. Add dates, grated coconut, chia, and sea salt. Process again until mixture starts to really come together into almost a paste. 3. Scoop out about 1/4 cup of crust from processor and form a ball in hands. Place ball in an opening in prepared pan and gently press on bottom and up sides, making sure not to let crust get too thin. This will be your support of the pudding mixture, so you want a thick bottom and sides. Repeat with the rest of the crust in each prepared opening. Place muffin pan in freezer for 1 hour. 4. For Filling: In high speed blender, or in food processor, blend together drained cashews, dates, coconut cream, banana, strawberries, chia, and Kefir (or milk). Mix until fully blended and totally smooth (about 2 minutes, at least). 5. Remove pan from freezer and spoon or pipe (if you want a fancier look) your filling into each prepared crust (you will have more filling than you do crust – I fill ramekins with the additional filling). Just know that the crust will get slightly soft after a day or so of filling in them. So fill them the day you will be eating them. 6. Return to refrigerator and let set for at least 3 hours. Once chilled and set, use plastic wrap to lift cups out of tins. Serve with fresh berries, grated coconut, and even coconut whipped cream, if desired. And make sure to check out the Raw Sweet Potato Chips yesterday from Heidi, at Adventures of a Gluten Free Mom, and then tomorrow go visit Tia, at Glugle Gluten Free for her entry (I think I know what it is, but I am not going to spoil the surprise). Kim – these look so delicious! I could definitely eat these for breakfast. Or lunch. Or dessert. YUM! Kim, these look phenomenal! I think I know what we’re adding to our breakfast menu for tomorrow! Can’t wait to see you in 9 days!!! Aww! Thanks, Iris! These are a hit with the kids and my hubby alike. Love when that happens. Stunning! And I love when you give us all the nutritional info to support such amazing, healthy treats! You and Melissa keep me straight. 😉 I bet you could make some of these and put them in your carry-on with a few ice packs for the Expo … what do you think? I’ll hang around the airport that extra two hours for one of these! Kidding … sort of. You are too sweet, Shirley! I just wish I had half of Melissa’s info that she has stored in her brain, stored in mine! 😉 And I would pack some up and take them with me to Chicago, but if I did they would never make them there because Kurt would eat them all before we got there! LOL See you in 3 days!!! Cannot wait! Very delicate. Nice to be able to serve something healthy and still look so enticing. Thanks Curtis! These are really good and simple to throw together. Must pick up some fresh strawberries to make this lovely dessert. Also love your 10 wonderfully essential living raw foods list. Very informative. Thanks Chris! 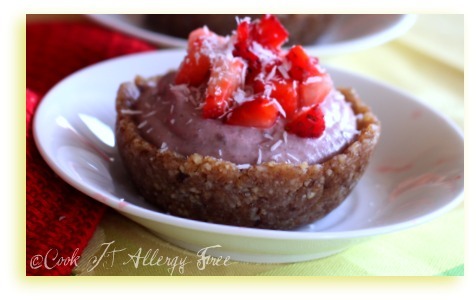 This is a really simple dessert to make, packed full of healthy ingredients! Kim, these look BEAUTIFUL!!!! Your kids are lucky! Another note-I bought a couple pounds (yes!) of chia seeds, and so am very happy to see them used in recipes. They are cool little nutrition bombs. It is so apparent by your post that you are a raw food expert. Thank you for your top essential living foods. So bright, full of life and hearty, these pudding pies are definitely going on my must-make list! Thanks, Elizabeth. I do not know if I would exactly call myself a raw food expert, but I do totally know the importance of the benefits of eating that way! I hope you like the pudding pies! 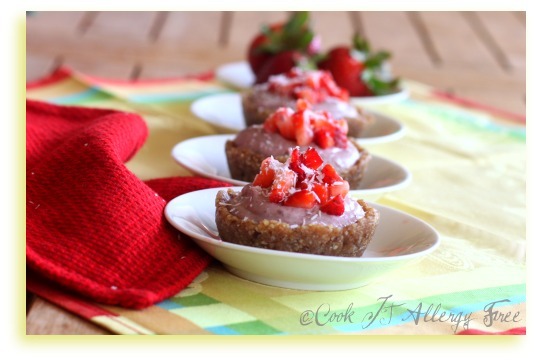 These are decadent, delicious healthy pie. thanks for the info regarding each food. Thanks for sharing with Hearth and soul blog hop. Lovely food best enjoyed with family & friends! Yummy! 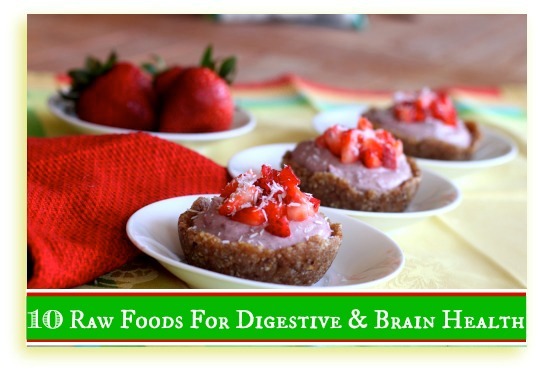 I love raw food creations! Where do you get your chai seeds from?